From the moment a child enters school, teachers are their role models. Our graduates make a strong impact on their classes. Teach children the skills they need for the rest of their lives. Are you ready to inspire the next generation of students? Do you want to be a great teacher of younger students? If you have a passion for helping children to learn and develop new skills, then the Early Childhood Education (PK-4) program at SRU will be the perfect fit for you. Our program has a long history of graduating exceptional teachers. With a curriculum that balances classroom learning with firsthand experiences, we'll help you develop the knowledge, skills, and disposition you'll need to educate and inspire the next generation. Why Choose Early Childhood PK-4? Teaching is more than a job; it's a calling. If you've gotten the call, you need a nurturing environment where you can grow your skills through mentoring and experiential learning opportunities. The SRU Early Childhood Education program prepares top teachers by providing a sequence of valuable learning experiences-from observing children in various educational settings to leading classrooms as a student teacher. Look no further than the SRU's Early Childhood alumni educating our children nationwide are a testimony to our reputation as teacher educators. We hope you will be one of them too! Connor MacKelvey is a junior, transfer student majoring in Early Childhood and Special Education at Slippery Rock University. His transition to SRU was effortless due to the credentials of the transfer counselors who assisted him. 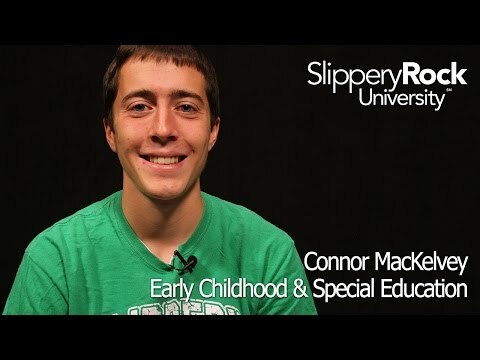 While at SRU, Connor has been able to build personal relationships with his professors, helping him to achieve academic success. He loves the community atmosphere on campus, as well as the opportunity to get involved and develop leadership skills. As a transfer student, Connor feels as though there was no transition for him at all; it seems like he has been attending SRU since his freshman year. Minor in Exceptionalities: Prepares students to work with children with special needs in a classroom setting. Dance: Prepares students to teach through integration of the arts. Spanish: Prepares students to work with students from culturally and linguistically diverse settings.